Custom Painted Radiator Cap Cover 94-14 Dodge, Chrysler, Jeep Billet Radiator Cap Cover 93-14 Dodge, Billet Radiator Cap Cover 93-14 Chrysler, Billet Radiator Cap Cover 93-14 Jeep, Dodge Challenger Radiator Cap Billet Cover, Dodge Charger Radiator Cap Billet Cover, Chrysler 300 Radiator Cap Billet Cover, Dodge Ram [American Brother Designs 3257RC] - $49.95 : 3rd Strike Performance, Your Source for Late Model MOPAR Performance Parts and Accessories! Mopar licensed Radiator Cap Cover. Professionally machined and painted, made from premium billet aluminum and finished with a durable paint coat as sleek and beautiful as the one on your Dodge, Chrysler or Jeep. Installs within minutes and made in the U.S.A. by American Brother Designs. 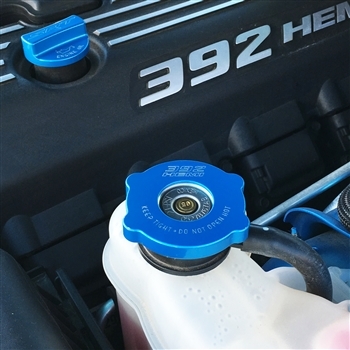 Must have stock or stock style radiator cap with the nubs on the 4 corners as the photo shows! *Note: May also fit other models. Must have this style radiator cap (most factory caps are this style since 2002) for this cover to fit! Will not fit most aftermarket radiator caps!